is a must have item for any professional or novice welder. It is extremely versatile and can be used on home projects, farm repairs as well as basic auto body welding tasks. It is able to operate on standard household 120 volt input power, meaning that you can use it wherever you are. It is able to operate gas-less or gas-shielded. Prior to choosing your Lincoln 140, go through this review. You will be able to adequately educate yourself on the pros and cons of the welder, and in the end, make an informed decision that you are happy with. This welder has a simple to use two knob tapped control. These basic controls make it easier to understand and execute the required tasks. It is a highly portable welder, and it can easily be plugged into a standard outlet, making it ideal for home use as well as commercial use. 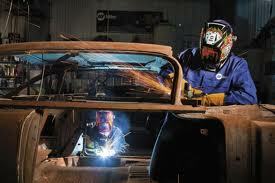 It is able to weld different sizes and gauges of metal with relative ease. This also applies to the types of metals that it can work with. This welder is highly durable and can be used for long durations of time without any issues arising. The wire tangle and crushing are reduced thanks to it’s fully adjustably drive system. It is available with a one year warranty that include the parts and labor. It is also available in a variety of models and designs, making it easier to find one that is compact, lightweight and portable. 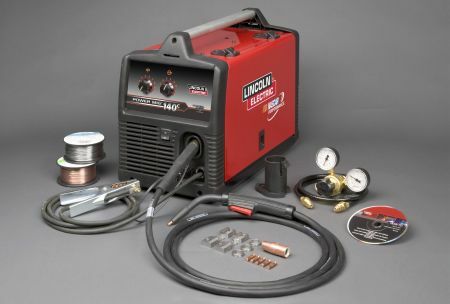 The welder is available with four voltage settings, and continuous wire feed speed adjustment. Therefore, if you are doing a job that needs a steady hand, or that will take a long period of time, you will be able to execute the job at hand with ease. It only comes with the very basic welding supplies you need to get you started. Should you want to try something fancy or advanced, you will need to purchase a range of the other accompanying supplies. There have been some issues with the motherboard that cause problems when feeding the wire. 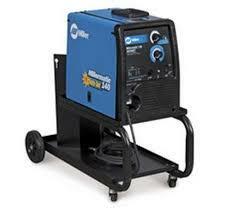 This welder can be used for gas less flux coed welding for deeper penetration of thick steel. It can also be applied as gas shielded MIG welding on thin gauge steel or aluminum. It has an easy to understand chard inside the unit which provides easy instructions on how the machine should be configured. In addition, there is a quick reference chart with the various machine settings for different metal thicknesses. 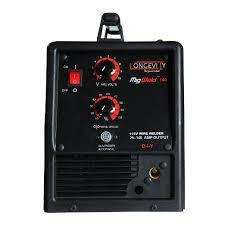 An excellent choice for first time welders as it is so easy to use. The fan makes a high pitched whining sound which can become annoying after a short period of time. Feeding of the wire is not always constant, meaning that you may not get a good looking weld. The control board has a few issues that come up from time to time. The customer reviews for this welder were mixed in regards to likeability, although they do lean heavily on the positive side. It seems that there are several small problems to contend with over time with this product, though on the whole, these problems do not affect the total output. There are issues with customer car and service from the manufacturer, meaning that things tale a little longer than normal to get resolved. This is a welder for someone who is completely task oriented, as it can easily be used from the beginning all the way to the end of a welding task. As it can operated from a standard household power source, it is more likely to be found at homes being used domestically, than it is to be found commercially. The one year guarantee is an assurance as to the quality of the product. Before you start your next welding project, go out and but this mask so that you can enjoy your welding experience.